When President Trump took a meeting with Democrat leaders Nancy Pelosi and Chuck Schumer, the press was allowed to be there but they probably weren't expecting the level of heated exchanges that erupted between the party leaders and the President. Trump opened with a statement on the border wall saying, "I am proud to shut down the government for border security, chuck. People in this country don't want criminals and people that have lots of problems and drugs pouring into our country." Then Pelosi began speaking in her usual monotone voice as if she were one of those talking AI heads that scientists have created. 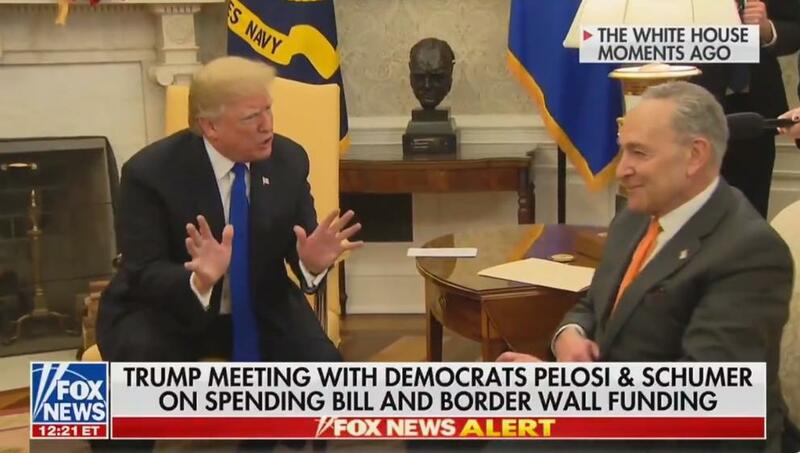 Trump wasn't having any of Pelosi's Democrat droning and he interjected multiple times to correct her on border security. Pelosi seemingly just tuned him out and continued as if she were reading from a teleprompter. Eventually, Pelosi could no longer ignore the points that Trump was countering with and she went off script. When responding to the border funding bill, Trump said, "Nancy, I'd have it passed in two seconds. It doesn't matter though because we can't get it passed in the Senate because we need ten Democrat votes. That's the problem". Pelosi had nothing to say to that other than, "Let us have our conversation when we meet with the press again." Really Nancy? Why can't we resolve the issue stopping funding of the border wall right now? Apparently, Michael Flynn Jr was impressed by the exchange because he retweeted a quote of the President's position on the border wall saying, "WOW!!" The President continually countered Pelosi's responses by saying, "Nancy, WE NEED BORDER SECURITY." Way to go Mr. President! It pains me to hear the political speak out of Pelosi who wants open borders and illegal immigration AND strong gun control, all counter-intuitive to American values. We need more Republican's who can stand up to Democrats like Pelosi and Schumer. All throughout the heated exchange, Vice President Mike Pence sat quietly observing the conversation from Trump's side. Related coverage: Tijuana Mayor Wants Caravan Organizers Arrested Saying "It's A Federal Crime"
Trump continued, "People are pouring into our country, including terrorists. We have terrorists. We caught ten terrorists over the last very short period of time. Ten! These are very serious people." He went on to praise the brave men and woman who protect our freedom and our great nation. "Our border agents, all of our law enforcement has been incredible." This caused Pelosi to shift uncomfortably in her seat. Chuck Schumer then tried his own hand at debating the President on the border issue. "We have a proposal that Democrats and Republicans will support, to do a CR that will not shut down the government. We urge you to take it." Trump replied, "And if it's not good border security I won't take it." Schumer adds, "It's very good border security." My favorite part was when Trump tried to break it down into terms that the two Democrats sitting in front of him could understand. "Let me tell you something Chuck, where you have walls, it's effective. Where you don't have walls, it is not effective." He has a point, there is still miles and miles of America's southern border which does not have sufficient protection. Pelosi and Schumer were voted in by foreign scum and illegal aliens committing voter fraud. Pelosi is from the mexican welfare state of california. This place should have declared martial law and the military should have moved in and taken over california and the foreign invaders should have been deported! Pelosi is a stupid globalist satanist and should be in prison. Schumer is a non white fake jew khazar who like his buddy karl marx is also a globalist satanist. He was voted in by a bunch of stupid khazars and black welfare recipients who think it is smart to let a horde of muslim terrorists invade our country illegally with the intent on murdering anyone who is not muslim and taking over our country. What I would like to know is how did these two idiots ever become lawmakers in the first place. This shows that the United states is going to hell and that only a remnant is left who are true Americans. Just looking at pelosi and schumer makes me sick. Since their voter base is all the scum from latin america, mexico and black semali welfare babies, why should they put up a border wall to protect Americans. A border wall would upset their voter base. I do not have enough contempt for these two losers. They have sold their souls to the devil and there is no reasoning with them. Pea brain pelosi and chucky has zero problem with obummer sending 150 billion to Iran but 5 billion to secure our southern border and they refuse. Sure shows where they sit with our best interests. 150B in cash sent to a terror sponsoring shithole under the cover of darkness vs a border wall for 5B! !